This set contains three brushes from the Icon range and will enable you to get painting right away. 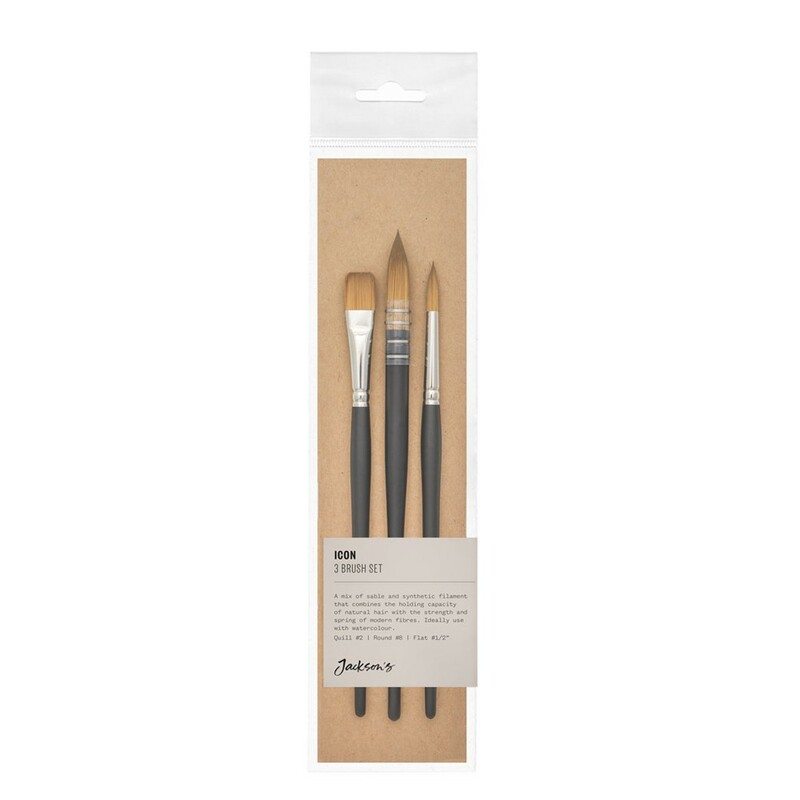 This Jackson's Icon brush set contains three brushes from the Icon range, supplied in a card-backed plastic wallet. The first is a Series 777 quill (size two). A synthetic quill is used for the ferrule of the brush, instead of a natural feather quill, and then wires are bound around it to hold it to the handle. 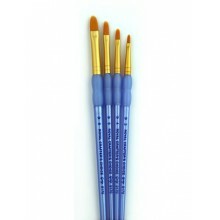 This makes the Series 777 a more durable brush than the equivalent natural quill brushes. 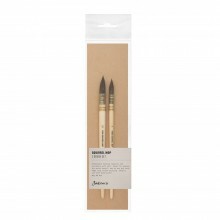 The second brush is a B700 Sable-Synthetic blend round (Size 8) and the final brush is a Series 702 1/2 inch flat brush, perfect for smooth washes. These brushes are both made from a mix of sable and synthetic fibres. 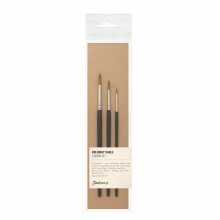 They offer a durable alternative to traditional sable brushes. I have only tried these briefly, just a practice to see how they lay down and pick up water and pigment but this was enough to be impressed. Once the gum was off they went effortless back into shape and on using them I found all act very well. I have never used a quill before (I only recently started with watercolour) and if this is an example of what I can expect from a quill then I will definitely being investing in more quill brushes. The flat was equally impressive and although I didn't really need this brush I think it will probably replace the 0.5 inch flat I am currently using. But it was the round that really impressed. This brush is fantastic to control and I was able to coax lines that you would expect from a small rigger from it's wonderful point, as well as a very smooth wash. Incredible quality in this brush set! I absolutely love the brushes and highly recommend them. The carrying capacity of these brushes is amazing for a synthetic.